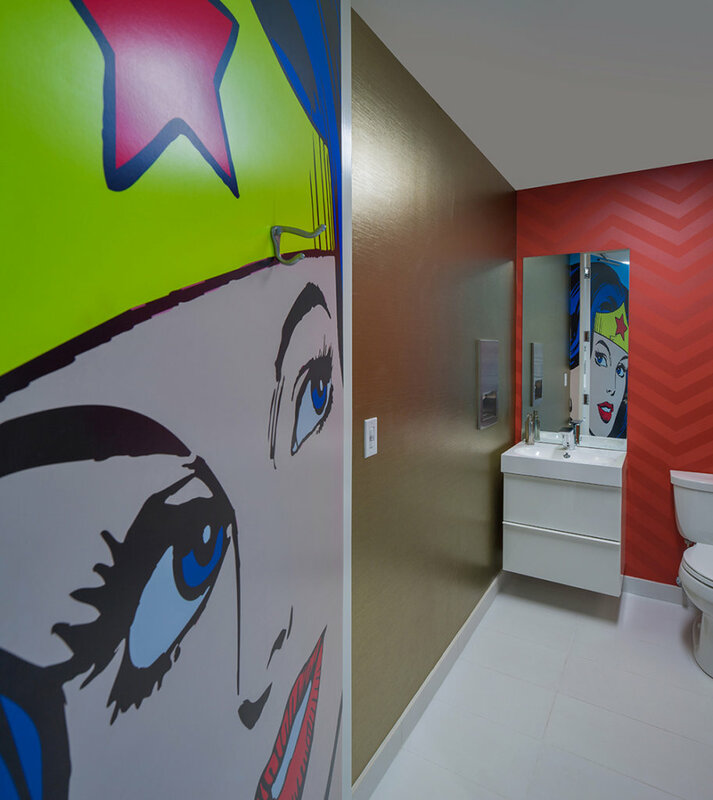 Can a construction company be synonymous with wonder and fun? In Barringer’s case, the answer is yes. However, this unique dynamic wasn’t established overnight. When it came to demonstrating those inspiring characteristics in their newly acquired home—a drab and outdated 5,000 square foot warehouse—this energized group of construction specialists looked for help from our firm. The issues with the construction company’s new space were numerous. 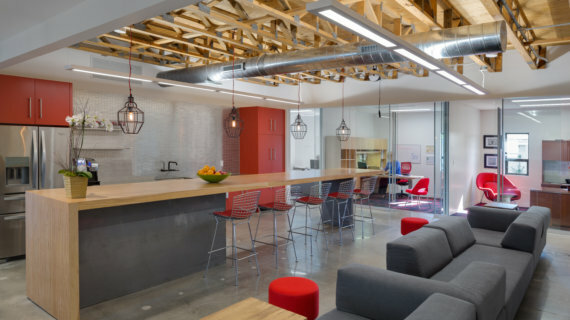 But most importantly it lacked the inviting, collaborative environments necessary to align the group’s workplace philosophy with its spatial needs and aesthetic sensibilities. 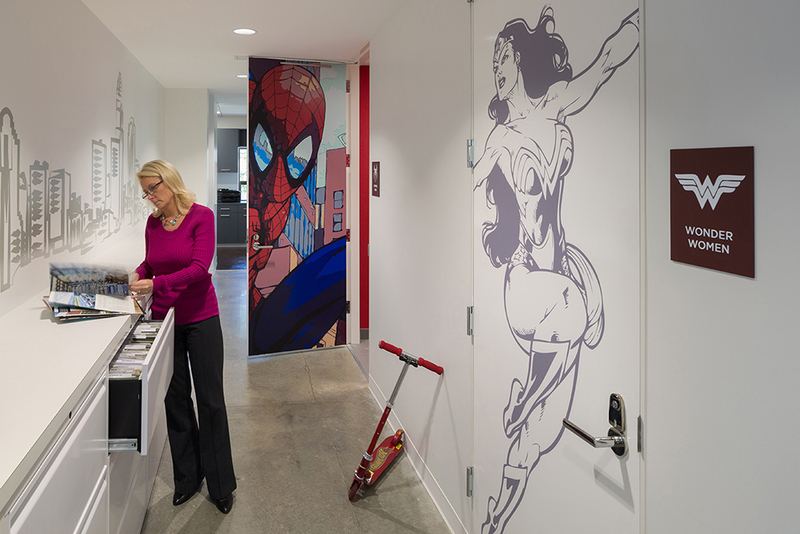 Moreover, the space was missing those key moments of inspiration that serve to galvanize a workforce creatively. 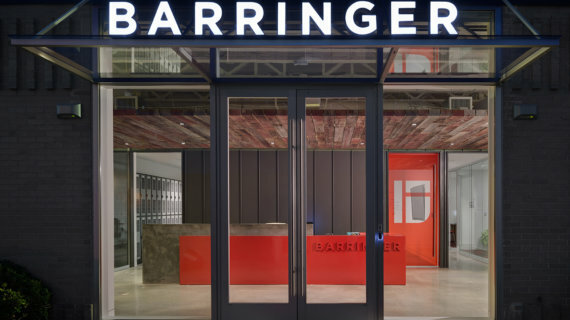 With a full understanding of the warehouse’s shortcomings, we helped Barringer overcome the building’s challenges by injecting it with unexpected moments of wonder, fun, and togetherness. For starters, the design team retained the building core and shell but removed the front walls of offices and a portion of the front façade to bring in more daylight. They also removed the existing ceiling, thereby revealing a beautifully preserved wood structure. That structure was left uncovered and is now featured in the main gathering space. 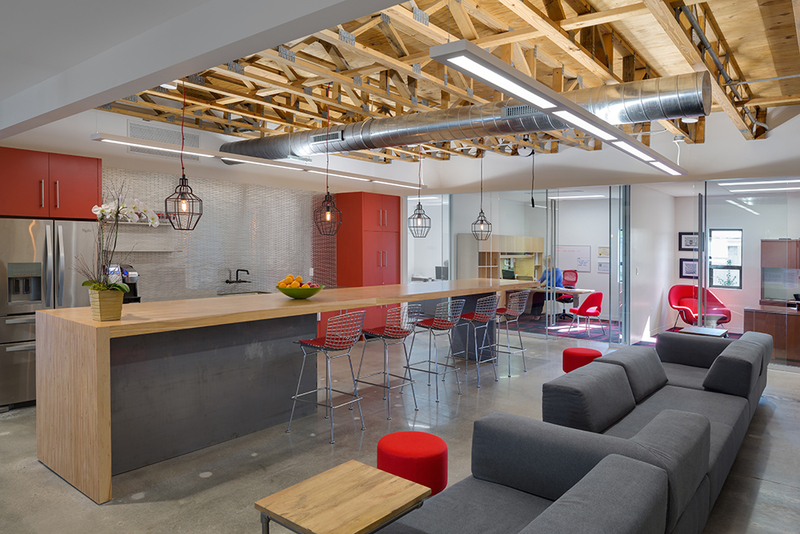 Such inspiring gathering spaces are a key component of the revamped warehouse. In fact, it is now organized around a series of them. 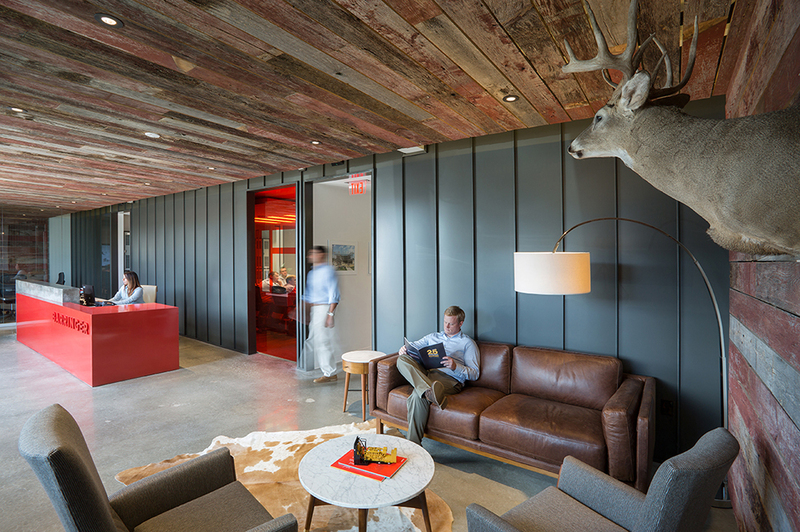 Those include a cozy den in the reception area and an open kitchen and bar (complete with beer taps) in the center of the warehouse. 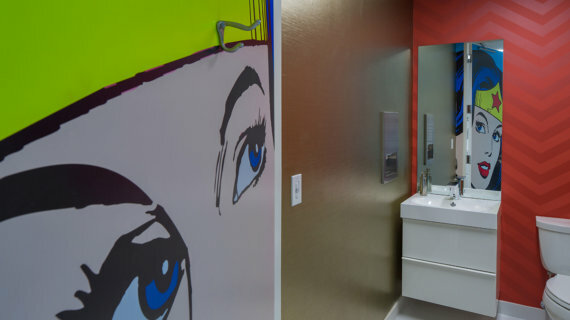 These spaces speak to the casual, quirky, an unexpected personality of Barringer. They also speak to the importance of community and team spirit, two hallmarks of the company’s approach. And for Barringer, the notion of community extends to people beyond their walls. In fact, the company’s new home is designed as a welcoming drop-in spot for the local community of subcontractors and vendors. 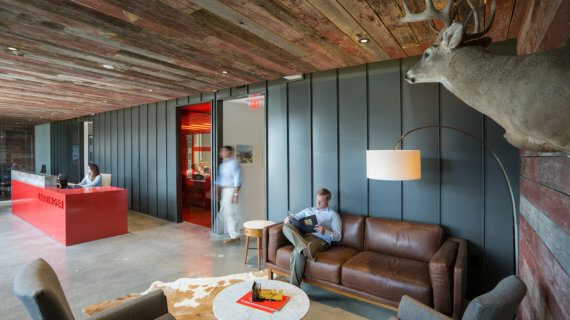 To help animate the gathering areas, the design team incorporated reclaimed and found materials, such as planks from an old barn, which also allude to a commitment to sustainability. Highlighting this commitment was a key driver of the renovation effort. The entire project is shot through with a dose of modernity thanks to a use of clean lines and updated materials, such as polished concrete and full-height glass partitions. The contrast betweenthese newer materials and the older, found elements offers a sense of drama and adds a compelling dimensionality to the space’s narrative. 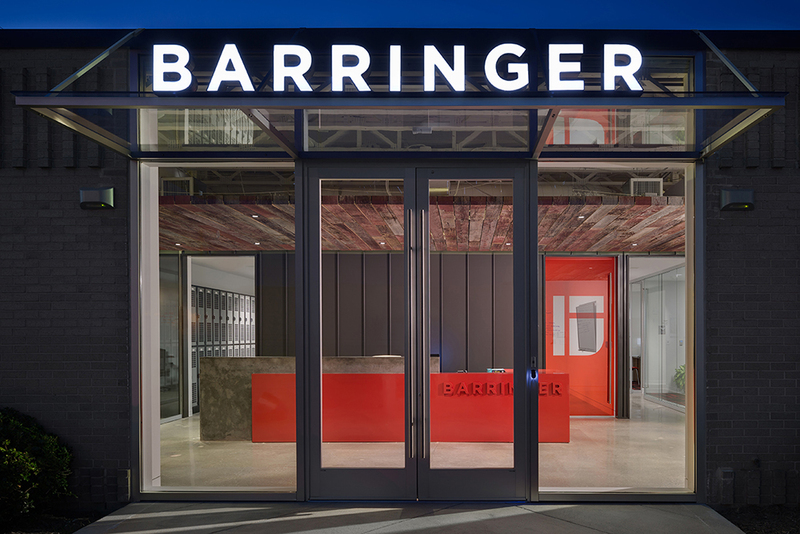 In total, the creative uses of construction materials and details help underscore Barringer’s commitment to craft, quality, and experience.